Click on image above to see full size pic! Will Billie Rock Bo's World? This month on DAYS OF OUR LIVES, the residents of Captive Island are finalyl on their way home. But not everybody will make it, and those who do will find that things have certainly changed in their absence... and not necessarily for the better! And a shocking twist puts Billie right back in the middle of Hope and Bo's marriage! As November begins, New Salem is on the verge of destruction, and everyone on the island must fight to stay alive! Previews executive producer Ken Corday:"With this storyline, we are heading towards salvation." But the exec hints that not everybody will make it home safely! "Most of these people are bein saved. Some are presumed dead." Of course, even those who make it back safe and sound won't have an easy time of things. For Bo and Hope,returning to Salem means having to face an old issue which was dredged up while on the island: Billie Reed and her feelings for the hunk! 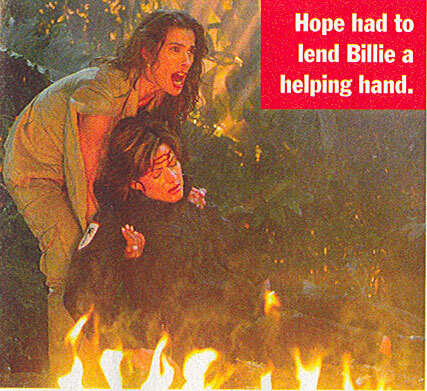 Recalling Billie's most recent stint in Salem, Hope's portrayer, Kristian Alfonso, says much was left unsaid. "Hope never forgave Billie, nor did she believe she was innocent in her involvement with Larry Welch. In Bo's eyes Billie was cleared. But in Hope's eyes? No way. Not even close." Alfonso maintains that her alter ego wouldn't be threatened by Billie unless she felt she was given a reason...which is exactly what Hope got on Captive Island! "She witnessed Billie and Bo kissing in the cave," the actress reminds us. "At the fime, Hope pulled herself together and dealt with the situation at hand, which was getting off the island." But that was then, and this is now, she continues. "It was not resolved. Hope blames Bo just as much as she blames Billie. It takes two to participate!" Peter Reckell (Bo) understands how Hope might feel a little insecure, despite her beauty, brains and strength. "It doesn't matter how solid you are in a relationship," he says. "Insecurities are going to creep up every now and then." Click on image above to see larger pic! And how does Billie feel about the one that got away? That, says portrayer Julie Pinson, should be obvious to even the most casual observer. "She loves him," the actress answers simply. "She'll always be in love with him." And this isn't exactly a secret! "She's told Hope," continues Pinson. "Billie is truly wearing her heart on her sleeve! But guess what: Billie respects that he's married and has children. It's an institution that Billie has learned not to mess with." In contemplating her character's history, Pinson suggests that one twist of fate changed all three of their lives forever. "If Bo and Billie had a child together, it might be a different story," she theorizes. But of course, that ship sailed when their daughter, Georgia, passed away shortly after her birth. "Does Hope know that Bo loves her?" asks Alfonso. "Absolutely, 100 percent. Will jealousy [become an issue] again? Probably so." By the end of November, shocking news could wind up bringign Billie and Bo closer as they put on their detective caps to solve a very personal mystery. "This storyline is really about Bo and Hope and their relationship and their history," says Reckell of the bombshell about to be dropped on the pair. "Something will come along to test the relationship, and a lot of people can relate to that."